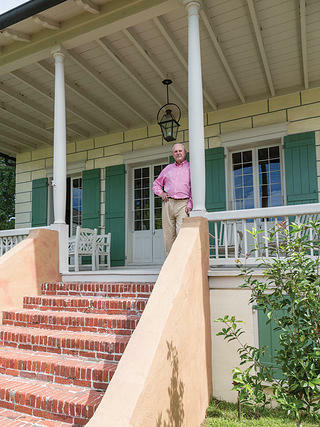 Professor and musician S. Frederick Starr restores an 1826 Creole-style house in New Orleans' Ninth Ward. 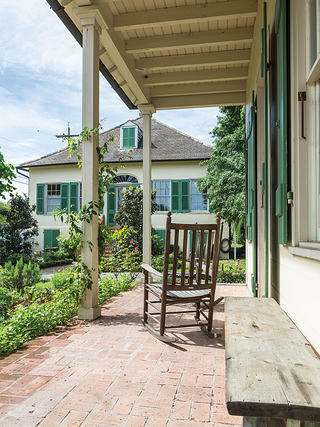 We’re sitting on the front porch of his 19th century New Orleans plantation house, which isn’t so much a well-executed restoration as it is a time machine with green cypress shutters and yellow plaster siding. When Hollywood scouts were looking for a setting for the 2006 time-travel thriller Déjà Vu, starring Denzel Washington, they chose Starr’s home. Although the building couldn’t accommodate all the oversize camera equipment, set designers re-created an exact replica of its first floor in a New Orleans warehouse. The kitchen in the main house occupies a former office space. The wallpaper-like surface of the original dining room walls is actually a hand-stenciled grid of gold suns bracketed by half moons. Twenty-five years ago, when Starr bought the house, you wouldn’t have been able to see any boat traffic from the front gallery. Blocking your view would have been a 10-foot tall chain-link fence, overgrown vegetation, and the remains of a cinderblock biker bar called Sarge’s that took up the entire front yard. But there was something about the house that Starr couldn’t resist. While serving as provost of Tulane University in the early 1980s, he and the school’s dean of architecture at the time, Ronald Filson, had the notion that they would buy some of the city’s threatened properties to restore and resell. Nearly a decade later, Starr heard the Lombard house was up for sale. Thanks to a motivated seller, he and Filson got it for $61,000 less than its $170,000 asking price. But the purchase of the dilapidated building did not sit well with his family. “I told my father and he thought I was insane,” says Starr, who later bought out his partner’s share. “But it was this really rare thing—a totally intact rural West Indian plantation house sitting right in the middle of the city.” Incredibly, all the home’s original architectural details remained, including hand-forged iron shutter pulls, all door latches and hinges, and pine floors. Thanks to meticulous record-keeping by 19th-century notaries, Starr was able to replicate the home’s antebellum appearance, from the living room’s mahogany Clementi piano to the West Indian armoire in the bedroom and the sundial out front. Several years ago, he even reconstructed the 700-square-foot kitchen house and backyard potager garden, based in part on an 1844 notarial watercolor of the property. Architect Rick Fifield designed a structure so true to the notarial painting that the local Historic District Landmarks Commission demanded he introduce a change, so it wouldn’t be mistaken as original. To assist his efforts, Starr enlisted a team of “co-conspirators,” including builder Jack Stewart and Tulane architecture and preservation professor Eugene D. Cizek. With his students, Cizek prepared a set of measured drawings of the house for the Historic American Buildings Survey, as well as computer simulations based on the notarial painting and other records. Starr, a former archaeologist and current chair of Johns Hopkins University’s Central Asia-Caucasus Institute, also used what he calls “forensic historic preservation” to piece together details that the notarial records didn’t show. Soil samples from the front yard revealed 200-year-old pollen with traces of grapefruit, lemon, loquat, and pomegranate, so he planted the same varieties. A rusty iron gutter bracket enabled a blacksmith to hand-forge precise copies, and helped determine the exact size of the original gutters. And bricks with well-worn, rounded sides revealed that the crown of the property’s well, reconstructed in 2008, lacked a superstructure. Instead, early owners used a heavy rope to pull up buckets of water, wearing down edges of the brick. The reclamation really picked up steam in 2002, when Starr was able to buy and demolish the abandoned biker bar in front and the empty shotgun house out back. (He has since purchased several additional small pieces of land, expanding the grounds to approximately 1.25 acres.) Once Sarge’s was gone, the team was able to excavate and rebuild the 9-foot-wide herringbone brick walkway leading from the front steps to a gate on Bartholomew Street. In late August 2005, New Orleans’ levees failed during the aftermath of the hurricane. At the time, Starr was at his office in Washington, D.C., where he lives two-thirds of the year. Trying to follow the calamity from a thousand miles away, he figured his house, like most of the Ninth Ward, was underwater. Miraculously, it had been spared. Even the basement was dry. 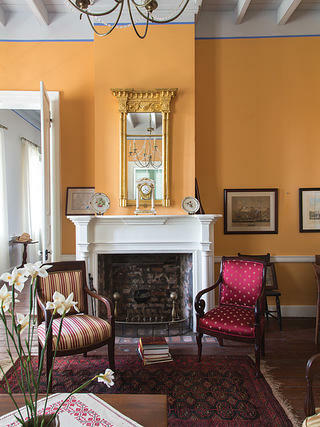 All four of the 1826 house's extra-large fireplaces, as well as its vivid paint colors, have been restored. Evidence suggests that the Norman trusses in the attic were assembled off-site and put into place once the walls of the house were up. It was likely New Orleans city surveyor Gilbert Joseph Pilie who designed the home, which echoes several others he is known to have planned along the river. 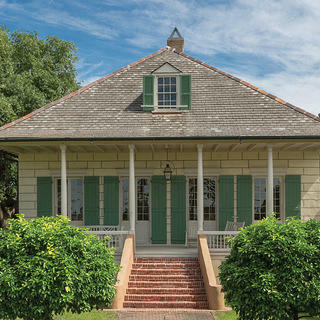 The house was constructed in the classic Creole/West Indian vernacular, with graceful turned columns on its large front gallery, tall French doors, and a roofline that flared like a bell. 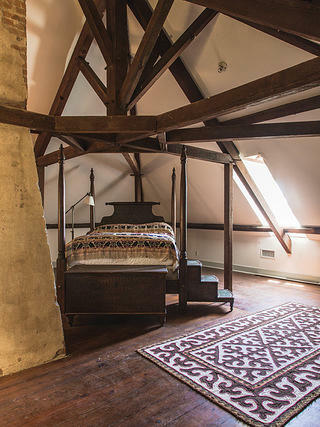 It was a fairly simple structure: six rooms on its first floor, no hallways, a ground floor for storage, and a large attic. The property, located just over a mile from the French Quarter, fronted 96 yards of the Mississippi River. Like many of the neighboring plantation owners, Joseph Guillaume Lombard and his wife, Marie Azélie Zeringue, initially farmed sugarcane, which they sold to a whiskey distillery nearby. They probably used hired hands for field labor and five enslaved workers, who likely lived in an outbuilding, for household help. An 1835 bill of sale described the house as “Une Belle Maison,” which would become the title of a book Starr wrote about the house’s history and restoration, published in 2013. Lombard Plantation changed hands three times over the next two decades, and during the 1840s, the land accommodated mixed crops sold at market, as well as hemp used for rope in New Orleans’ busy shipping industry. But by the mid-1900s, the property had been subdivided to accommodate waves of German immigrants, who settled in the shotgun houses that would define the area. A few blocks away, the Streetcar Desire—yes, that one—rumbled down Royal Street. After World War II, the area began a slow, steady decline into poverty, and Lombard’s owners at the time were so poor, they sold off the front and back yards and divided the home’s dank ground floor into two apartments. By the time Starr came upon the scene in the early 1990s, the area’s median income was less than $15,000 a year, and drugs, smuggled in via ships arriving from South America, were the main neighborhood trade. After a lunch of catfish po' boys, seafood gumbo, and the aforementioned beer, Starr gives me the tour. We walk from the porch through the heavy cypress front doors, and it’s like entering a museum dedicatited to 19th-century Creole style. The front room has been restored as a proper office/study, with its period French barometer and reproduction Campeche chair. Several framed elephant folios by John James Audubon decorate the walls, a nod to young Joseph Lombard, whom Starr hypothesizes took art lessons from the ornithologist when Audubon lived downtown during the 1820s. Starr on the front porch, against a backdrop of French doors and a hand-painted plaster wall. Flowers, vegetables, herbs, and ornamental plants grow in the potager garden next to the rebuilt kitchen house. Starr had some of the walls tested to determine original paint colors, asking the analysts to adjust for oxidation. 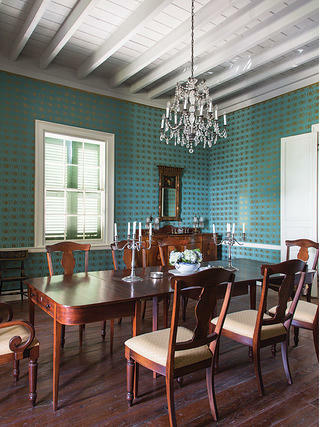 Most surprising are the walls in the dining room, which look like wallpaper, but are really golden flaming suns stenciled on an aquamarine background. Starr had a local artist re-stencil the pattern, found under an eighth-inch-thick layer of plaster. 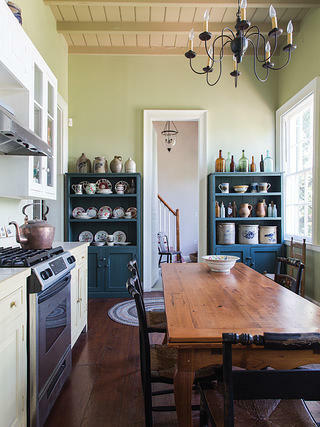 Whatever period furniture Starr couldn’t find or afford, he had Baton Rouge cabinetmaker F. Paul Naquin construct to exacting specifications, including a 7-foot-tall West Indian armoire in the living room and simple wooden benches outside the kitchen house. The reproductions are so accurate that Naquin left his signature on each piece, lest they be sold off as originals in the future. Mary Louise Christovich, a doyenne of New Orleans' historic preservation scene, credits Starr with helping to revive the neighborhood. “It’s astonishing that of 21 major houses of this design [in this location], all are gone with the exception of this one,” says Christovich. “But what Fred has accomplished has uplifted the entire four- or five-block area.” For his part, Starr believes the community also feels pride in the renewed house, which he shares with his wife, Christina. “There’s a feeling of anguish when a tooth is removed from a smile,” he says. Although the bulk of the restoration was completed in 2012, the tweaks continue. With the help of Stewart and Cizek, Starr is reconstructing the cypress cistern pictured in the notarial plan. There’s also been some talk about rebuilding the pigeon house. And there’s always work to be done in the yard, including removing the last vestige of chain-link fence embedded in an ancient oak by the back patio—another excellent spot, Starr says, to drink beer on a warm summer night.